So what’s Tairis all about, then? I’m a Gaelic Polytheist who’s lucky enough to be living in Scotland, and this website is all about the many different things I’ve been researching and looking into over the years. As I write, I learn, and it helps me to focus and think about things. Hopefully this site will give a good idea of how I interpret Gaelic Polytheism, and in a wider context, Celtic Reconstructionism too. You can also find me at my blog, which hosts all my CR/GP-oriented (or related) blether. Reconstructionism is a path that requires a lot of legwork and for the most part I stick to what I know best – Scottish and, to a lesser extent, Irish beliefs and customs. I take a fairly conservative approach to my practices and generally stick to the Scottish side of things, but I do find that comparative work and research with Irish practice is very helpful since Scotland’s Gaelic heritage owes so much to Ireland and many of the avenues of my research lead back there. What I do is constantly evolving and hopefully I’ll be able to reflect that by keeping the site up to date. Feel free to email me with your thoughts, questions, ideas. 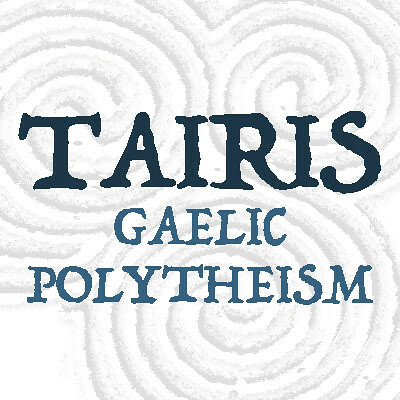 During the course of my involvement in the wider Celtic Recontructionist movement I’ve participated in many of the online forums and groups and I strongly believe that Gaelic Polytheism is nothing without community. I am currently serving as the Uachtarán of Gaol Naofa, an international organisation that aims to provide community and support for Gaelic Polytheists, as well as furthering the practices and resources available to seekers and dedicated Gaelic Polytheists alike. I am also a council member of CAORANN – Celts Against Oppression, Racism and Neo-Nazism – a group of Celtic Reconstructionists and allies who are dedicated to speaking out against racism, cultural appropriation, and the misuse and abuse of Celtic spiritualities and symbolism. And why ‘Tairis’? To be perfectly honest, I stumbled across the word in Macbain’s dictionary. Its meaning is given as, “the dairymaid’s cry to calm a cow” and really, it just made me laugh. It sums up a lot of the things I love about Scotland – that there’s a word for such an act, so integral to the culture, so succinct. And I like cows, so it seemed apt. More seriously though, other meanings are given: In Scottish Gaelic, it means loving or kind; going back to early Irish, it meant loyal, true. All of these meanings speak to the core of what I do and how I feel about the culture I live in and am now a part of. I love what I do, and at the heart of it, I see and seek truth in it. You can keep up to date with any future developments on my main blog, also imaginatively called Tairis, and there’s also Tairis Tales. As the current head of Gaol Naofa you might also find that website useful, and we also now have a Youtube channel with some videos aimed at introducing the festivals and other Gaelic Polytheist subjects. If you like doing the Facebook thing, you can like our Gaol Naofa page, and our CAORANN page, too. If you’re interested in joining the Gaelic Polytheism group that’s run by Gaol Naofa (you don’t have to be a member of the organisation to join) then please read the guidelines first. If you have any thoughts, comments, questions, or whatever, feel free to comment over on the blog or email me. I would add, though, that I am unable to help anyone with their family tree or genealogy in general. My advice in general is that when you get further back and start finding links to characters featured in the myths and early Irish literature, take any information you find there with a gigantic pinch of salt. There are reasons for those tales to claim Biblical origins, Spanish origins, Egyptian origins, and so on. It’s a nice story but don’t put too much stock in it. I mean, come on. It’s just rude. And incredibly annoying.